This municipality in the province of Almeria is situated 58 kilometres away from the capital city and at a height of over 400 metres above sea level. One of the main tourist attractions in this village is the Natural Park “Karst in Yesos de Sorbas” with over 1000 cavities excavated in gypsum over millions of years. The archaeological remains indicate us that there were human settlements around the year 2000 before our era so its Greek origin is possible although there is no proof of this. However, it is known as a fact that an Iberian village settled there and who maintained commercial relations with the Phoenician villages in the area. The romans that settled in Sorbas began the gypsum exploitation. Later on the Arab occupation, during its reign of approximately 700 years would leave us a legacy of ovens that still function today, a characteristic trace of streets and a personal style of ceramic fabrication. During the year 1488, Sorbas was finally abandoned in the hands of the Catholic Kings, where only a few Muslims reconverted to Christianity called ‘Moriscos’ were left behind, although due to the pressure laid on by the church, they also abandoned this place and head towards the north of Africa. The presence of Arab rebels caused a difficult repopulation due to the constant incursions that continued to occur even during the year 1577. If we go for a stroll around the Constitution Square we’ll come across an old building of religious cult, the Santa Maria church, built upon the the remains of an old mosque. A natural area of great beauty with caves of natural origin excavated in gypsum over the passage of time. A religious celebration that is celebrated in a very spacial way in Sorbas. 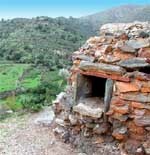 In this district they still preserve Moorish ovens that still function and where they still elaborate ceramic since the period of al-Andalus and the first repopulators of Sorbas. If you visit Sorbas, you’ll be able to enjoy a rich and varied gastronomy, which is mainly based on the use of typical products for the elaboration of its black pudding (morcilla), red spicy sausage (chorizo) and varied dishes like salads and soups. Sorbas, situated in the centre of the Almeria province, at 30 kilometres away from the Tabernas Desert, near Sierra Alhamilla and approximately 40 kilometres away from the beaches of Levante and the Natural Park of Cabo de Gata-Nijar. Natural Park "Karst in Gypsums in Sorbas"
This area of around 2400 hectares has gradually been sculpted over the centuries due to power of the water on the gypsum of the municipality of Sorbas in Almeria. A multitude of cavities have originated both on the surface as well as underground, currently being one of the most important natural areas in the world. Inside this Natural Park we must highlight the Water Cave, the Covadura Cave, the Gypsum Cave and the Treasure Cave. All these caves provide the visitor a magical experience where to enjoy columns of gypsum of different colours, crystals, stalactites and stalagmites of great natural beauty. This path covers the northern part of the municipality of Sorbas in Alicante. During this trekking route we’ll enjoy a typical flora and fauna of the area. This path of about 4.5 kilometres will show us the main superficial features of the Natural Park. The faster route to get from Malaga airport to Sorbas is through Granada and Guadix, from where we must head to the south until we reach Tabernas and then to the east where Sorbas is located.